← It’s Raining Deluxe Editions! The subtitle of Iliya Troyanov’s Collector of Worlds had me giddy with excitement: A Novel of Sir Richard Francis Burton. The last time I’d read a novel of Richard Francis Burton it was To Your Scattered Bodies Go, the first book of Philip Jose Farmer’s classic Riverworld saga, in which an eternally resurrected Burton hunts an eternally resurrected Hermann Goring down a river, along which lives every human being who ever lived. Burton was a gift to Farmer, a figure who was easily as fantastic as his major literary contribution, the first major English translation of the 1001 Arabian Nights. He spoke 30 languages, completed a Hajj (in 1853 no less, when you really had to walk there), fought more duels “than perhaps any other man of his time”, brought both the Thousand and One Nights and the Kama Sutra to the English-speaking world, and tried in earnest to learn the language of monkeys. If Farmer had made this stuff up, it would have been gratuitous. But Burton really lived, publishing widely and kept extensive diaries proving he’d lived, so he was fair game. In all of human history, he was the one real man suited to serve as the hero of Farmer’s novel. The possibilities Burton offers to a contemporary, literary writer are many. Even I, a Burton fangirl if there have ever been any, will admit he is a problematic figure. He may have been something of a real-life Allan Quartermain, but Burton could not have been Burton and Quartermain could not have been Quartermain if the British hadn’t been swarming all over Africa and the Middle East during that period, conscripting, bullying and shooting the locals. Even Burton’s unusual sensitivity to the rights and customs of the local people is offset by his participation, and a sense that he is treating his life as an extravagant circus-show. Still, I have the sense that there was something different about Burton, something which set him apart from his peers. Regardless of his moral culpability, he did things no man before him did, spoke loudly against things no other man would (to the great detriment of his career and personal life), and left a bigger footprint than almost anyone else. Whatever sort of man he was, he was a special one. Therein is the meat and potatoes of a great novel. The biggest disappointment of Troyanov’s treatment of the material is that it is boring. He takes on the modern task of filing all the heights of the Burton legend down, laboriously and at length turning exciting and remarkable episodes of his life into bland, introspective, third-person accounts. The “action” (as it were) is narrated by three “native” observers: a Hindu manservant, three Turkish officials, and the Yao guide Sidi Mubarak Bombay. All of these observers are deeply confused by Burton as a man, and so their recollections of him are marked by a total inability to account for anything he does. Burton is never allowed to speak for himself in these chapters. As soon as he opens his mouth, his words are replaced by a banal description of approximately what he might have said. Burton is given an interspersed “point of view”, but it also fails to speak for the man. These passages are psychological episodes. Rather than put you in the event, they remove you by fogging the view with the ramblings of Burton’s memories, or self-doubt. Again, he never seems to speak. He hums and haws his way through a Hajj and a months-long hike from Zanzibar to Lake Tanganyika. There is certainly an expert hand drawing the scenes for this play. The landscapes and weather patterns of North and East Africa some so alive as to make the reader shiver and sweat along with the suffering characters. And perhaps this was Troyanov’s project to some extent: to show a place so unmasterable that even characters written into its midst can’t take their place at the top of the narrative hierarchy. Burton, along with the rest of the British (and local, for that matter) life, was barely a smudge on the inalterable qualities of Africa. If that be the case, I say: pick someone other than Burton! Why squander such a wonderful character by burying him in all this noise? Unless the project is to bury him, and all I can say to that is that I think our historical memory is poorer for it. It isn’t that I think the task of fiction is the romanticize our history: far from it. But any treatment of a historical personage – especially one with such a legendary reputation as Burton – has to address the question of why he or she has the reputation he has. If Burton is just another Brit, this time with an affinity for languages, why have we made of him the legend that we have? What special, or privileged, or misinterpreted, or unrecorded quality of the man or his chroniclers brought about the history we’ve written and accepted? 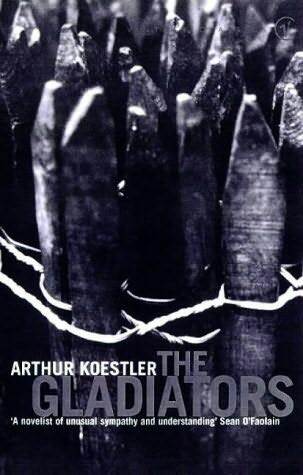 This is probably the central question of a much better work of historical fiction: Arthur Koestler’s The Gladiators. Koestler, like Troyanov, has chosen an oft-romanticized but problematic historical figure as the centre of his novel – this time the escaped gladiator-slave and revolutionary Spartacus. Koestler’s account of the events of the Gladiator War (73-71 BCE) is nuanced, politically astute, and incredibly relevant. He deftly shows that the problems of leaders two thousand years ago are the same problems of leaders today, and the ethics of leadership are every bit as knotty and unappreciated. This war is bloody and completely without heroes, without a “good guy” or “right” in sight. Nevertheless, Spartacus emerges as an important figure. He has been humanized, especially when compared to Kirk Douglas’s bronzed swashbuckler. He flirts heavily with tyranny and commits many atrocities. His followers denounce him from time to time, and he makes no friends. And yet we understand what it is that makes him a hero of history. His character might be complicated, but it hasn’t been diminished. Whether the role of the novelist is to serve history or simply to tell a story, the use of real people is a powerful tool. History has already awarded them weight. You need to treat the character as if they carry that weight, either to offset the weight with other devices or to address why it’s there. You can’t pretend it isn’t there. Or you could, I suppose, but the result (in my case, at least) with make the reader suspicious of your motivations or storytelling skill.